Amaechi said, as governor, he did not receive over N3 trillion as alleged by his successor, Nyesom Wike. Amaechi made the clarification at a stakeholders’ forum on corruption, organised by the Federal Ministry of Justice in Abuja, Thursday. According to Amaechi, “If you had followed the Rivers State government when I was governor, we were the first state to introduce the Public Procurement Law in the country. The State cabinet used to call the Director General of Public Procurement in the state as an alternative governor, that they wanted an amendment to that law. “The reason they wanted amendment is that he (DG) refused to increase the threshold to one hundred million naira, per ministry, instead he reduced it to ten million naira. “I had a battle with him (DG BPE) and the world bank who insisted that we should not go for an amendment but should persuade him to increase the threshold. I remember the cabinet tried to go to court against him and I remember that he was also trying to go to court against Commissioners. “In fact, the procurement DG wrote a memo that I felt was very incriminating requesting that since the law requires the governor to take any commissioner who doesn’t comply with the public procurement law to court, I should please take the commissioner of education to court for not complying. Everybody in the cabinet felt that he was an alternative governor, they felt that he was slowing the process”, he said. “Within that period, we insisted on engaging the indigenous communities on how much we received and how we spent the money. That is why I feel that after this ministerial appointment, I should do everything possible to stay away from government because in spite of all the forms of transparency I introduced in government, one man could begin to tell lies to Nigerians and Nigerians believe him. “The governor of Rivers State said I squandered N3trillion naira. I did not receive up to N1.8 trillion naira as governor, both from IGR and funds from federal allocation. So, how could I have squandered money I did not even receive in the first place? You can see the politics of lies and lies,” he said. “Please come to all of us in government, all the ministers in government and engage us on open government. For me, for ministry of transportation any information you want please write to us we will not only give you, we will give you on time. “This is because all of us that have become ministers have been entrusted by the President. His first policy is corruption; the second one is economic development. We have been appointed by the President to go and do those following things to ensure that there is fund that we save from the people’s money to develop the community and the community we have is the Nigerian community. “Indeed you are our leaders, we are here by the grace of God and by your grace and we believe that you have the right to ask questions. We believe that you have the right to demand accountability from ministers. 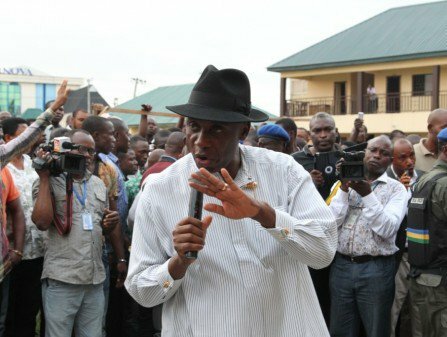 We believe that nobody has the right to rise from just being an ordinary graduate of a university by courtesy of holding public office, he now owns mansions, cars.” Amaechi stated. Earlier, in his speech, the Attorney General and Minister of Justice Abubakar Malami said, “ As you are all aware, President Buhari made fighting corruption one of the pillars of this administration’s policy. Since assuming office, every effort has been made to build on and expand on what was initiated by previous governments. Amongst these key priorities is the need to recover stolen funds and to pay back to the Nigerian society what they have lost to corruption.